With about 17% of the world’s proven gas reserves, Gazprom has more gas than most other companies. Coming from liquid ring vacuum systems, skilled Russian engineers were seeking for an alternative. 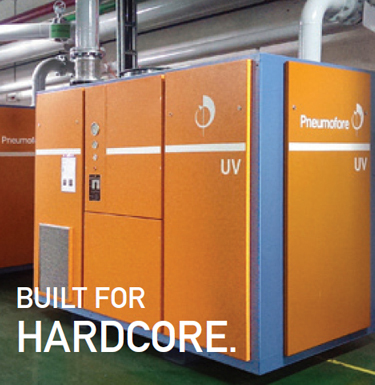 UV50 H pumps of Pneumofore with water vapor suction capability are used now with vast results in terms of drying time and involved costs. The extra sturdy design fits the special requirements for mobile operation on truck trailers. Initially, several tests were performed. A pipeline 19 km [11,8 miles] long with 700 mm [27,55 inch] internal diameter, with water film of average 0,5 mm [0,01 inch] was degassed at Dew Point of -27°C [-16,6°F] in 10 days with 104 kW [140 HP] only. The sample vacuum system consisted of two UV50 H vacuum pumps of Pneumofore, each with 3.200 m3/h [1885 cfm] capacity and the total capability to evacuate at 60 Hz the quantity of 428 kg [944 lb] of water per hour, with the residual pressure level of 0,5 mbar(a) [29,9 inHg V]. 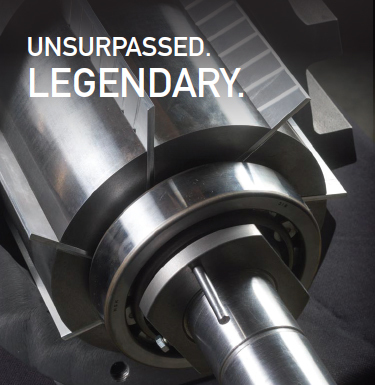 The extraordinary feature of UV H pumps to evacuate such large volumes of water vapor is unique and the single stage performance of these simple machines allowed huge savings of time and money. In the past, vacuum was made by several water ring vacuum pumps requiring a cooling water system with heat exchanger. With strongly variable ambient temperatures, the cooling water temperature of liquid ring pumps could not be kept constant over the year. During hot days, the cooling water temperature of 26°C [79°F] would halve the capacity in m3/h [cfm] as well as reduce the maximum vacuum level to 60 mbar(a) [28 inHg V]. This made the large liquid ring vacuum pumps obsolete in hot climatic circumstances as the Dew Point could not be reached. Also winter was problematic due to the polar temperatures in northern Russian areas, causing freezing of cooling liquids with danger of cooling circuit brakes. 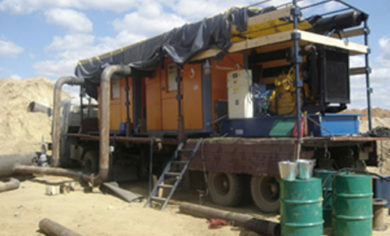 Furthermore, having such systems installed on mobile trailers required up to double the space, also due to the higher weight of the liquid ring system. 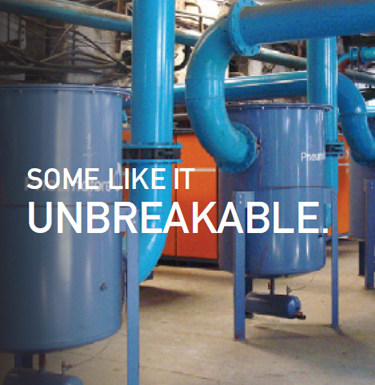 Drying processes are standard business for Pneumofore, however, previously our installations were for degassing in the food, tiles or chemical industry. 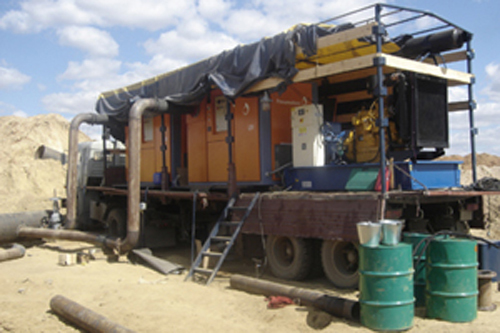 The main challenge in the design of UV50 H pumps for Gazprom was the requirement to resist the transportation, installed on a 12 meter trailer, on unpaved, sometimes even off-road tracks. Shock adsorbers were installed for vibrations and to avoid the transfer of torsional fluctuations from the trailer. A special, extra sturdy frame was designed to satisfy these requirements. Heavy hinges were installed for the easy lifting and positioning of the pumps. The combination of water vapor suction capability of UV H pumps with the tailor-made, strong design of the pumps cabin gave extraordinary, almost unexpected results. Drying of gas pipelines with vacuum had never been so easy, the advantages compared to alternatives, like drying with super-dry air, or with methanol, or with inert gas such as nitrogen, are vast. 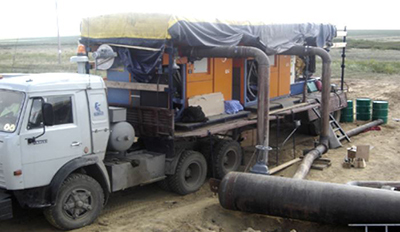 The easy handling of simple and reliable UV H pumps to commission natural gas pipelines is also attractive because the pipeline is gassed up immediately. On-field reports show how air drying does not extract water from side pipe traps in the pipeline and methanol swabbing often does not dry the pipe to an acceptable level. Further, operators prefer to avoid processes with hazardous gases. Simple Return of Investment calculations motivated several companies active in gas pipeline commissioning to use Pneumofore vacuum pumps, sometimes combined with roots as second stage to reach even lower Dew Points. The evidence of minimal power requirements also for high capacity vacuum systems, completely air cooled, with Dew Point down to -52°C [-61,6°F], easily transported and operated, makes Vacuum Drying the preferred method for the commissioning of natural gas pipelines.